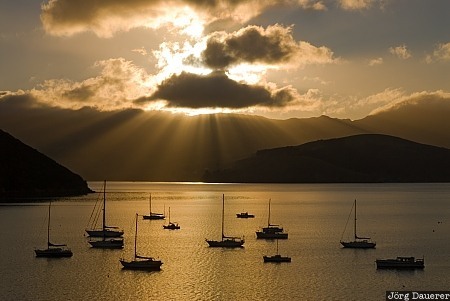 Sun Beams over Akaroa Harbour on the Banks Peninsula and backlit boats in the foreground illuminated by early morning light. The Banks Peninsula is in eastern Canterbury on the south island of New Zealand. This photo was taken in the morning of a cloudy day in November of 2008. This photo is part of the exhibition Sun Beams (October 2011). This photo was the image of the month in June of 2016. This photo was taken with a digital camera.